Sometimes chance gives it to the professional archaeologist like Howard Carter to make a history-making discovery. But at other times, it’s an amateur, a mere enthusiast whose lot it is. And it was to the latter, one Michael Ventris, a humble architect, that chance gave acclaim: the person who deciphered Europe’s oldest known written script, Linear B, opening up history’s annals. Born in Britain in 1922, Ventris’s interest in ancient Europe was sparked at age 14, by a museum exhibition in London showcasing Minoan artefacts discovered by Sir Arthur Evans, while on a school excursion. It was sheer chance that Ventris and Evans met at the museum, the seasoned then-86-year-old archaeologist igniting the lad’s impressionable imagination. During their encounter, the conversation naturally turned to ancient languages—Ventris was already fluent in both modern French and German—a topic that fascinated Ventris, who, as a mere seven-year old, had taken up the study of Egyptian hieroglyphs as his hobby. Linear B Minoan clay tablet The Linear B script is characterised by about 90 different characters interspersed with signs for numbers (represented below, left), as well as the depiction of everyday objects and commodities such as pots, cloth and grain. In the early 20th century, archaeologists excavated some of the most famous sites of Ancient Greece finding large numbers of clay tablets inscribed with this type of script, which baffled them as they were significantly different to any other known script. 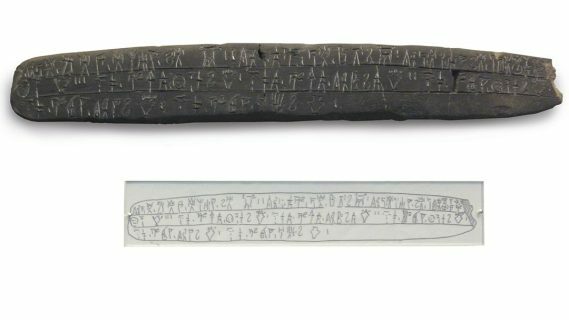 For more than a decade, Ventris worked to decipher the script, succeeding in 1952, and opening up the understanding of Europe’s oldest known written language. But despite Evans’ old age and a lifetime of experience as an archaeologist, which many envy to this day, when it came to reading Minoan writings and glyphs he’d found in Crete—the aforementioned Linear B—he was at a loss. The years spent trying to decipher it had proved futile. In the course of their conversation Evans mentioned this to the young Ventris, and showed the youth some undeciphered clay tablets from the Minoans. Immediately Ventris was hooked, and from that point it became his life’s quest to decipher them. Ventris would never become a professional archaeologist, nor even an historian. Instead, he trained as an architect at the Architectural Association School in London. Yet, his mathematical bent and expertise helped him to recognise patterns underpinning the raw symbols, the very quality required for the task. But to achieve this, Ventris had first to be trained in the ancient languages and texts, including Greek, which he did. However, he believed that Linear B and Greek were two separate languages and that Linear B was not an Indo-European language as was Greek, but rather more like ancient Etruscan, from Italy. These beliefs he set out in his first journal article, published in The American Journal of Archaeology in 1940, when he was aged just 18. Several days after making his groundbreaking discovery, Ventris announced it to the world on BBC Radio. Listening in was one John Chadwick, an expert in early Greek, who got in touch with Ventris and offered to collaborate on the translation of Linear B texts. Ventris agreed and the two set about the project. 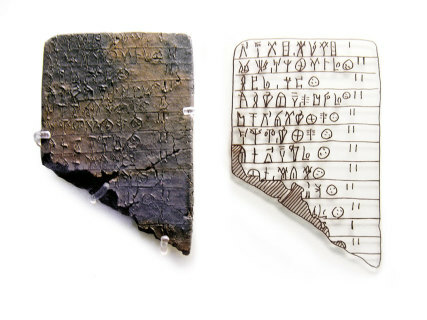 As this was unfolding, another archaeologist, Carl Blegen, chanced upon a new collection of Linear B tablets at the ancient site of Pylos, on the western coast of the Peloponnesian Peninsula of southern Greece, providing a physical connection between the two languages. Ventris and Chadwick learned of Blegen’s discovery and immediately widened their collaboration to include him and his trove. To their pleasant surprise the way opened, for the Linear B scripts of Crete and Pylos contained many identical or similar symbols and words, indicating close cultural links between the two locations in Minoan times. These were of the kind about which Homer had described at the time of the Trojan War, which was around 1200 bc. Between 1953 and 1956, Ventris, Chadwick and other scholars produced the seminal book on the language, Documents in Mycenaean Greek, in which they laid out their case that Linear B was the written form used by the Mycenaeans and Minoans from around 1450 bc onwards, making it Europe’s oldest known written language. The book, or at least its thesis, was acclaimed. However, Ventris would not enjoy his success for long, for later in 1956, he died in a car accident, aged just 34. But he lives on thanks to his contribution to history. His gravestone is inscribed, “Michael Ventris who first read the Minoan Linear B script as Greek 1922–1956.” It is a fitting reminder of Ventris’s brilliance and achievement and contribution to the study of humanity’s heritage. The Tripod tablet is one of the most famous Linear B inscriptions. Discovered by Carl Blegen in 1952 at the ancient site of Pylos, this tablet was instrumental to Michael Ventris’s deciphering of Linear B. The “document” consists of three lines of text separated by two horizontal lines, read left to right. The name “Tripod Tablet” was given to it, as the tripod (a form of cauldron) symbol appears repeatedly in the text as part of an inventory of items.